Self-renewal is central to the regenerative capacity of stem cells. Homeostasis within the blood system is dependent on a strict balance between the capacity of the hematopoietic stem cell pool to differentiate and its ability to undergo renewal divisions. 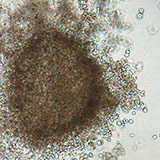 In contrast, to replenish the malignant leukemic clone, leukemic stem cells are thought to function by exploiting this normally exquisitely regulated self-renewal machinery. Our research sets out to identify novel stem cell regulators that could inform the design of enhanced hematopoietic stem cell-based regenerative therapies one on hand and leukemic stem cell-targeted anti-leukemic therapies on the other. We focus on understanding the molecular control of stemness at the level of RNA processing and regulation impose diverse effects on their targets to enforce cellular fate decisions. Our lab is exploring the premise that RNA binding protein-driven post-transcriptional control is a critical mode by which stemness and transformation are regulated in hematopoiesis. We interrogate this unique paradigm through three major research themes that rely on the use of a host of cutting edge tools and platforms as outlined below. Identifying post-transcriptional mediators of hematopoietic stem cell self-renewal. Blood stem cell transplants can be a curative cancer treatment however in many cases are limited by donor samples having too few stem cells. Our research uses functional genetics approaches coupled with in vivo pre-clinical stem cell read-outs in xenotransplantation assays to identify post-transcriptional mediators of hematopoietic stem cell expansion. Defining the RNA binding protein effectors of leukemic stem cell function in myeloid leukemia. Using genetic strategies and loss and gain of function approaches we capitalize on a combination of mouse and primary human leukemia patient sample model systems to identify RNA binding proteins whose dysregulation underlies leukemogenesis and leukemic stem cell-driven relapse in vivo. Dissecting the integrated role of RNA binding proteins in stemness from a systems perspective. RNA binding proteins synchronously regulate the fates of functionally similar RNAs, in what have been termed “RNA regulons”. We use a variety of unbiased genome and proteome scale approaches to define the rules that govern this regulation and determine key downstream circuitries of stem cell regulating RNA binding proteins whose targeting could provide the basis for novel regenerative and/or anti-leukemic treatments.